Imagine your life is reliant on a single machine that is reliant on a three prong outlet that is attached to an even bulkier power pack, sound good so far? Let’s dive in a bit here..take a moment, close your eyes and picture an unimaginably annoying machine that sounds like an awkward vacuum from the early 90’s, now open your eyes to this awkward long tube of life that is secured by an elastic band that feels like sand paper rubbing against my neck. If the sand paper feeling rubbing up against your neck didn’t make the hair on your arms stand up, then as always, I like to save the best for last. To top off the metaphorical cherry on the ice cream sundae, not only is the vent a hefty 30+ pounds but it has has two traveling companions, let me introduce them; thing 1 and thing 2 (queue the musical score from the original cinematic adventure Jaws). Thing 1, being the evil car size battery required to power the vent on the go and last but certainly not least thing 2, where most woman my age have a Louis Vuitton with them at all times, I have this magical cylindrical device known as an oxygen tank which is the perfect addition to every young woman’s entourage. I am dependent on a ventilator 24 hours a day. Life is difficult for everybody, but being paralyzed from the neck down tends to make things a bit more difficult than usual. The difference between my life and most others is that people can breathe on their own. The ventilator helps me but it is not part of me. Everywhere I go it is on the back of my chair. Ever since I was a little girl I always felt somewhat out of place but with the help of God, he has given me a good life and provided me with purpose. I have an amazing mother who is my world, my main caretaker, along with family members and nurses. All I have ever known is my injury; I love, I cry, I dance, I sing with my injury. It’s hard to imagine a life without it. Yes, this vent travels everywhere with me wherever I go but I am not afraid of it and I never let it slow me down. I live life to the fullest. Even though there are moments where I am terrified to be away from “thing 1” a.k.a. the battery bag I never let fear dictate my actions, always pushing ahead. Along with thing 1 and thing 2, my metaphorical Louis Vuitton, I also have an Ambu, “the mascara” that I must keep with me at all times in the off chance that I start arching/spasming. I can’t pull in the vent when I am spasming so I need the help of Ambu and an oxygen tank.Life is difficult but it is also a lot of fun. I may be on a vent but I sing and go out to see a lot of shows. Musical theater productions are my favorite. I also love going to concerts. No matter where I go and what I do, I know I always need to be careful but that I also have to continue pushing myself and pushing others around me. Regardless of my “condition” there is nothing that will stop me from being who I am. 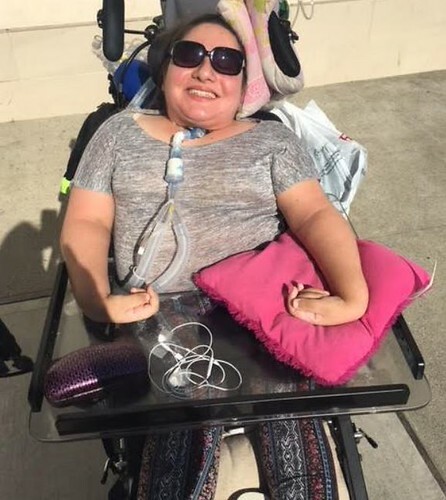 This entry was posted in Feature stories, Guest Posts and tagged acute spinal cord injury information, adaptive adventures, antonia sinibaldi, vent user blog on July 26, 2018 by Tiffiny.